A league that helps build State Champions! We are currently looking for youth football programs who would like to join the best league in southern NH. We can help you grow and develop players for your high school program. Contact us for more details. 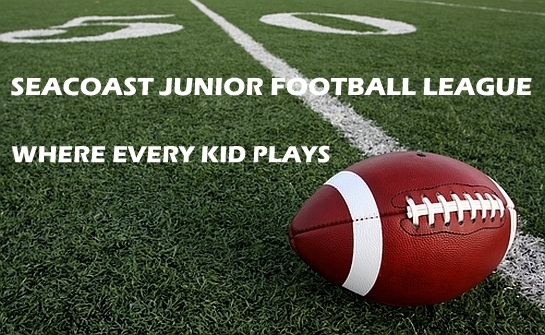 The Seacoast Junior Football Leagues (SJFL) mission is to provide youth in grades 3rd - 8th the opportunity to participate in a safe tackle football. We are a "High School Feeder" model youth football league in which our member organizations are committed to providing an opportunity for every youth participant to learn the game of football; while focusing on maximum community participation and working closely with their local high school football programs. Each local organization operates independently and cooperatively with each other to provide a positive athletic experience for each participant and to allow each participant to play in a youth football league that’s competitive and fair. If you have any questions, additions, find any errors, have any information, pictures, or announcements for the Seacoast Junior Football League Website, please email maria03842@gmail.com.